19 Jan 2013: It's freezing and we are surrounded by snow, and the heating was turned off at 8pm last night. I did some testing of the temperatures next day at 8am, after 12 hours of no heating. 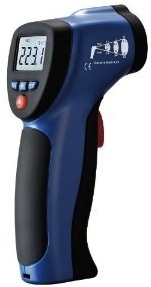 I use an infrared thermometer, but it rounds all readings to the nearest integer degree. Sometimes, it flutters between two, hence the dual figures below. The internal walls and ground floor are 19º/18º, upper ceilings 18/17º, the external walls 16/17º. The house extension walls were 16º, and the floor slab (which has no heating pipes in it) 17º. For those considering an investment in triple glazing, the normal double glazed windows were 14º and the triple glazing surfaces were 15º. I don't have a single glazed window to compare with, but the exterior of the glazing was zero, so one guesses that its the same on the inside as glass is thin and conductive. Matt F asked below about these Infrared Thermometers. Ones like this vary from £20 to £30, and perhaps there are some that cost more, but the one I have was £30 from Maplins. It would be nice to have one that shows tenths of a degree. This one has an illuminated display if you have to work in the dark, and has a laser pointer if you want to pick on a detailed object like a pipe, valve, lightbulb or lintel edge. The range is unknown, but it seems to work over 10m and perhaps 20m. This is better than paying £850 for a slightly better one from FLIR. 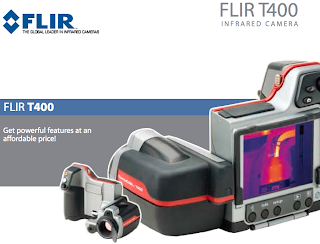 It is scandalous how much thermographic cameras cost. We are in a time like the early days of digital cameras and scanner when they were very very expensive. Scanners collapsed in price after USB came in, and cameras collapsed in price once they were included in mobile phones. I don't even use a camera now, the iPhone does everything! Unfortunately, they believe that nobody will ever create a mass market for thermographic cameras, so they might as well maintain the high price. This one in the picture is over £10,000 I think, more than a car or motorcycle. That cannot be right! The readings for the fabric are impressive, as I'm sure, judging by all your efforts, we might have predicted! However, it's the windows that really stand out and seem to bear out my long held suspicion that glazing improvements are not the place to start for the homeowner. As you don't appear to have any single glazed windows, you can't compare those with the double glazed - that would be interesting. I've been contemplating the merits of an IR thermometer for PV maintenance but decent ones aren't cheap. What did you use? Ones like this vary from £20 to £30, and perhaps there are some that cost more, but the one i have was £30 from Maplins. It would be nice to have one that shows tenths of a degree. I dont have a single glazed window to compare with, but the exterior of the glazing was zero, so one guesses that its the same on the inside as glass is thin and conductive. this one has an illuminated display if you have to work in the dark, and has a laser pointer if you want to pick on a detailed object like a pipe, valve, lightbulb or lintel edge. Okay - that's a different league to the ones I get in my inbox from FLIR and Fluke, which are very fancy IR thermal scanners and have software for analysis but start at around £850. Horses for courses I suppose but your version might do for pointing at a module on a roof to check temperatures (although we are supposed to measure the temp. on the back surface) - is the range okay for that? The point I was making on glazing is that the relative payback of investing in double, let alone triple glazing is not good compared to insulation measures. Hi Matt, I have access to a FLIR camera and you can see earlier images of the pictures I got a year ago. do an index search on the blog for earlier postings. It is grossly overpriced! I dont know what the range is, but if you point it at object 10-20m away, there is a reading. The laser pointer helps you to be precise about corners or edges. My point was that triple glazing might not be worth it if good double glazing is doing a good enough job! maybe I will call on a neighbour with my thermometer and ask them to let me take a reading.